I read this book aloud to my younger daughter (age 9), and I loved it as much as she did! 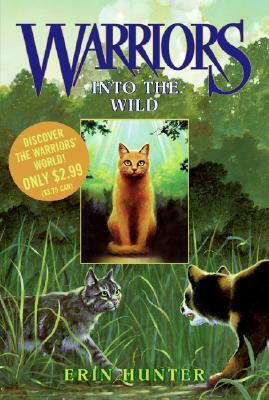 The book is about feral cats who live in the wild, and they are divided into four clans: Thunderclan, Riverclan, Shadowclan, and Windclan. Each clan has its own territory, and each clan is headed by its leader, followed by the deputy, warriors, apprentices, and queens. There are also clan elders and a medicine cat. The main character in this story is Rusty, a housecat who was out mouse hunting in the forest near his home and came across a ThunderClan apprentice, Greypaw. Unbeknownst to him, the tussle between Greypaw and Rusty was observed by ThunderClan's leader, Bluestar, and Greypaw's mentor, Lionheart. They are both impressed with Rusty's natural fighting skills, and Bluestar makes Rusty an offer: ThunderClan will take him in and train him to be a warrior, but he must be willing to give up living the cushy life of a housecat. It isn't a very difficult decision for Rusty to make. The thought of being a warrior cat excites him, and he decides to join ThunderClan. I loved learning all about the different clans and each member's role in it. Taking in an outsider, like Rusty, shows how desperate ThunderClan is to train warriors and it is tough on Rusty from the get-go. He is not a blooded warrior, and he constantly has to prove himself to the others and fights for acceptance within the clan. At the outset, it was a little confusing with all the different names of the cats. However, as the story unfolded, it became easier to keep them all straight. The author also includes a very handy resource at the beginning of the book, which sets out the members of each clan and their role. This is exactly the type of book that I would have devoured as a child. I am so thrilled to find this series for my daughter, and I'm looking forward to continuing to read it to her! 5 stars!! It was superb, and I will likely re-read it in the future. You should definitely read it if you enjoy animal stories or YA fantasy.